You're invited to attend a Construction Open House for the Hwy 65/107 'Continuous Green T' intersection project that begins late-April, 2019. See how this new, safer intersection will work and learn what to expect during construction. Project staff will be on-hand to answer any questions. Access to Hwy 107 and through lanes on Hwy 65 to be open during construction. Motorists will encounter lane shifts, reduced speeds and flaggers. 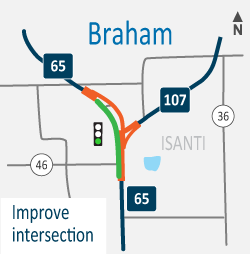 MnDOT will install a newly redesigned 'T' intersection with 'Continuous Green' traffic signal system at the junction of Hwy 65 and Hwy 107 near Braham. The new intersection will feature extended turn lanes, widened shoulders and concrete raised medians for lane separation, and a 'Continuous Green' through-lane on southbound Highway 65. When complete in June 2019, the project will improve safety and traffic flow through this busily traveled intersection in Isanti County. MnDOT installed its first continuous green T intersection at Hwy 25/Hwy 12 south of Buffalo in 2015.